Alastair Yates Midlands News 1978 from pebblemill on Vimeo. 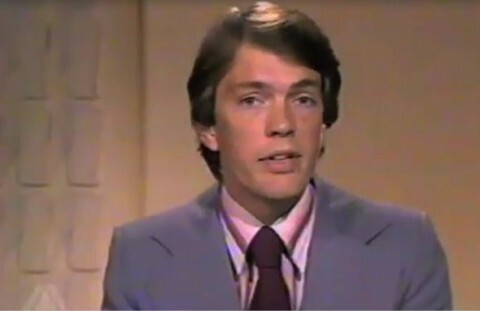 This clip courtesy of TV Ark, was recorded in 1978 in the Presentation studio (adjacent to the Midlands Today studio) as I was reading a bulletin into Midlands Today‬. I joined the regional newsroom team in 1978, from BBC Radio Derby, and as well as my TV duties I also read the Midlands news on Radio 4 VHF. Before long I was also invited to present the morning show on BBC Radio Birmingham (now WM). I left Pebble Mill in 1980 to join Selina Scott as co-anchor of North Tonight at Grampian TV in Scotland. ‪Doesn’t my voice sound plummy: I put that down to David Stevens, Head of Pres., who was trying to rid me of my Burton upon Trent accent.‬ Seems to have paid off though as my career took me to SKY NEWS, where I was the first male presenter on air, then on to BBC NEWS CHANNEL and WORLD. I also joined Deutsche Welle World TV in Germany for a couple of years and am now at Classic FM news. I remember in one of my early appearances, when I was petrified, introducing a programme featuring the heir to the throne as… Princess Charles! Joan Collins walked out crying from his WM Morning Show –thus achieving the Station’s ONLY ever national tabloid headline.!! !